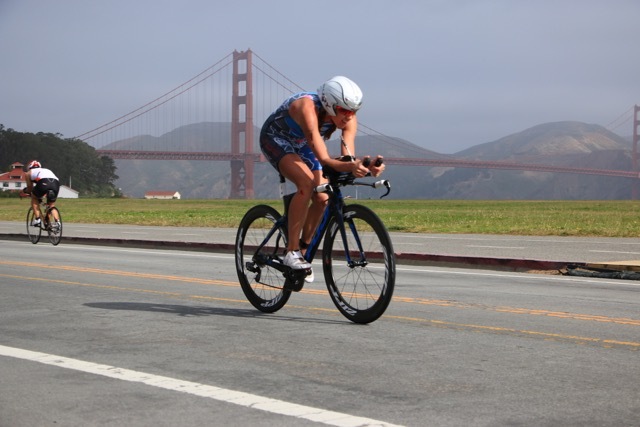 This was my second time returning back to San Fransisco for the famous Escape from Alcatraz Triathlon. Nate and I made the trip, while my parents stayed back in St. Louis with Caroline. The weather was spectacular the day before the race. 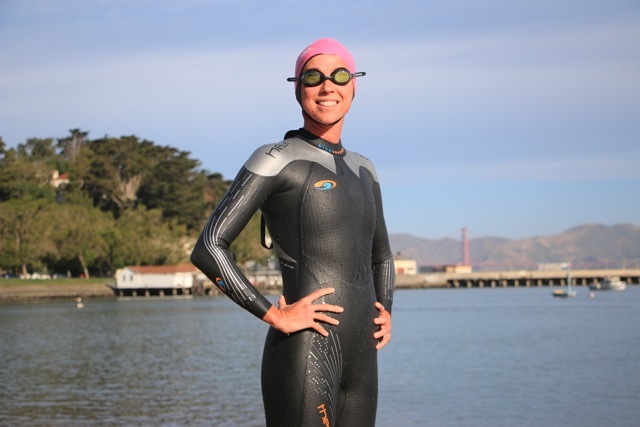 I had an opportunity to test out the new Blueseventy Thermal Helix that is specifically designed for cold water races. With the potential water temperature to be in the lower 50s, I was really excited about this suit. I loved the suit, the water did not feel cold and it was very comfortable and fast. I decided to wear the suit the following day in the race along with the Blueseventy Thermal Skull Cap and the Blueseventy Element Goggles. Race morning temperatures were much warmer than in the past. Water temp was 61 degrees and we saw sunshine prior to race start. Two years ago, it was so foggy, I could not see too far in front of me out at sea. Two years ago, I won this race. This year however, was a very competitive field and my goal for this race was a podium finish. I ended up just off the podium, in fourth place. I am a bit disappointed; however, I had several challenges to overcome on the race course and all considering I am glad I was able to finish! This race is so different from any other triathlon. I can understand why there is such an appeal to compete in this iconic race. The scenery is beautiful, the hills are challenging and the run is a mix of off-road, sand, hills, grass and gravel. Boarding the boat at 6:30AM, you can sense the nerves and excitement from all the other competitors. 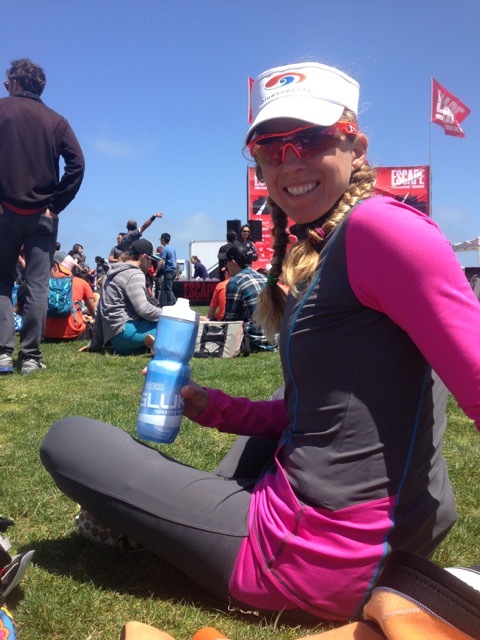 Normally the hour before a race, I am setting up transition, warming up, etc, but the hour before this race I am relaxing on the ferry and chatting with other competitors while I am topping of my fuel stores with GLUKOS Gummies and GLUKOS Energy Powder Drink Mix. 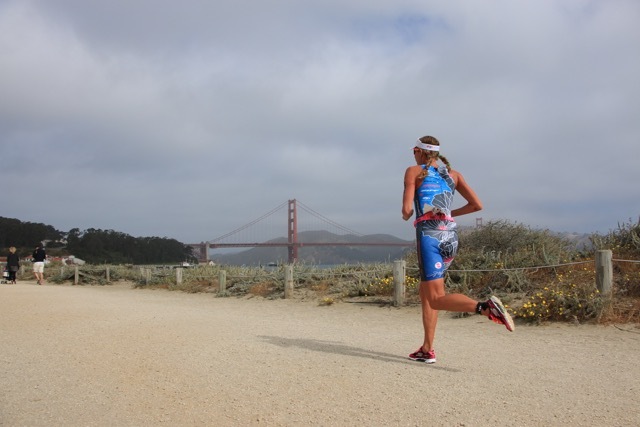 I raced the entire day in my Triflare Blue Poppies Race suit which you can order here. Five minutes before the gun went off, I found a spot on the ferry, hanging onto the edge and waiting for the horn to go. I had a good dive, goggles stayed on and was off. I focused on staying smooth and calm at the start. I started at the opposite side of the men (and wrong side of the current), so lost a big pack from the start. After 400 meters or so, I saw a big pack about 50 meters in front of me and tired to work my way up to the pack the remainder of the swim. This swim was epic. The current was so strong, if you swam six strokes without sighting, you were 15 meters off course! The swells were so big that it was tough to time breathing with the timing of the waves, especially since the swells were erratic. Needless to say, I swallowed about three big gulps of sea water. With about 500 meters left to go in the swim I caught a few people who had fallen back from the men’s pack. I exited the water a with Katie Z and happy with my swim. I made sure this year to put on my back up pair of Skechers GOrun4s shoes on before running the 1200meters to transition. By the time I got to transition, I am pretty sure my heart rate was the spiked the highest all race. I was getting warm running with my wetsuit and happy to strip it off. I mounted my Fuji and just about five seconds behind Katie. I got into my shoes and was in my aero bars reaching down to buckle my cycling shoe and before I knew it I swerved slightly into a cone. I reacted poorly and overcorrected myself too much and was heading straight for the curb. I crashed into the eight inch curb. I could not believe this was happening. In my twelve years of racing as a professional, this has never happened, but there is still more to learn. I don’t know if my mind was still disoriented from the wavy swim or what. Fortunately, I could get back on my bike right away. I could feel a pain in my hip the remainder of the race, but it was nothing that was keeping me from continuing on. After getting back on my bike, I saw Katie about 45 seconds up the road and focused on catching back up to her. I took over the lead around mile six and held the lead until mile 10 when Holly Lawerence flew past me on the downhill. I tried to match her pace on the decents, but her descending skills were much better than mine. I think after the crash I had a little more anxiety of crashing again. I exited the bike about 1:20 down from Holly and started the run. My nutrition plan for the ride was 24 oz of water mixed with 2 packets of the GLUKOS Energy Powder Fruit Punch Drink Mix. The Cycling equipment I used for the day: Fuji Norcom Straight 1.1 with: Zipp Firestrike 404 tubulars and Tangent SLSpeed Tires, Quarq Elsa R Power-Meter, SRAM eTap wireless components, ISM PS 1.0 saddle, Zipp Vuka Stealth Base Bars with Vuka Ski-Tip Extensions, Speedfill Z4+ with the A2 Stem Mount, and the A2 system, Sampson Stratics Carbon Ti Pedals, and Rudy Project Wing 57 Helmet and Rudy Project Tralyx Red Fluo glasses. Here is my Quarq Powerfile presented by Trainingpeaks. 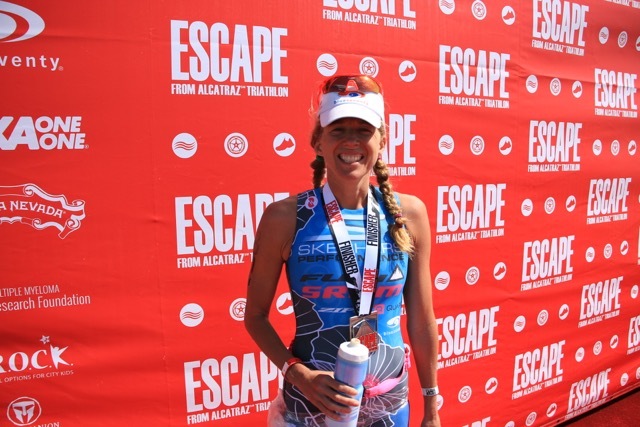 Once on into transition I put on my Skechers GoRun4s, grabbed my Blueseventy Visor, 2 GLUKOS Energy Gels, Rudy Project Tralyx Red Fluo Glasses, and T1 Pro Magnetic Race Belt. The first two miles of the run are flat, but with a very strong headwind it felt like I was running straight into a wall. Katie passed me just before we started to climb and I managed to stick with her about ten seconds back until we hit the downhill section of the course. Downhill trail running is a weakness for me and I did my best to focus on turnover and keep my legs moving. The sand portion of the course was really tough this year. The sand was extremely soft and it felt like my body was running in a sink hole each step! About 5 and a half miles into the run, Lindsey Jerdonick passed me and I did what I could to keep up, but lost contact on the stairs. The last couple of miles, I enjoyed the crowd and happy to give high fives at the finish. Although I fell short of my goal, I was relieved I was able to get back up after I hit the curb and finish the race. I am confident my crash bruises and swelling will be healed up soon and I can get back into some training by the end of the week. 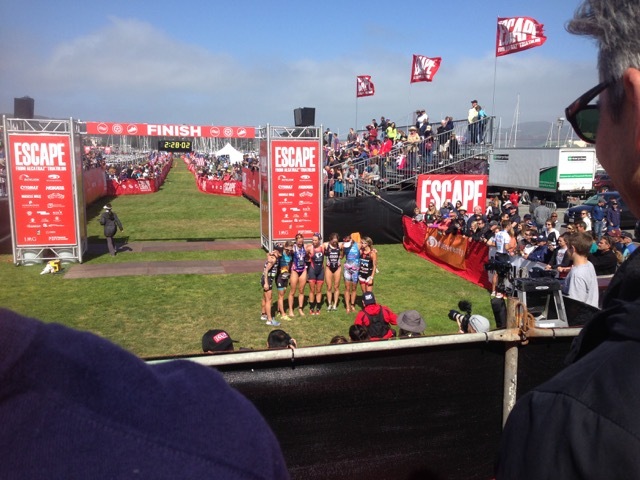 Congrats to Holly Lawrence on a fantastic race and impressive win! Congrats to all the participants who completed the race on an epic day. 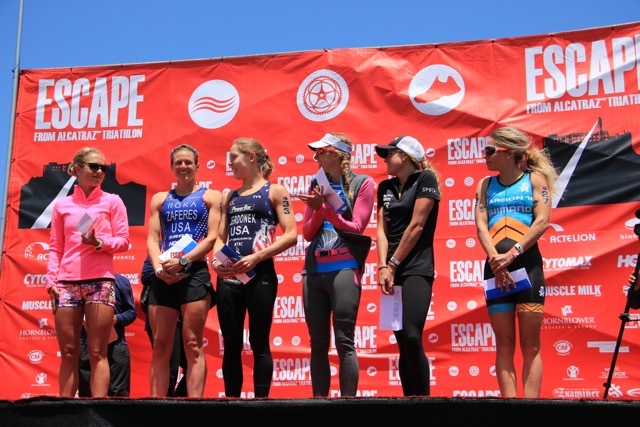 Wind, sun, surf and sand were just some of the elements to battle on a tough, iconic course. Thanks so much to all my sponsors for their amazing support. I look forward to my next block of racing in July.